If you are suicidal and need emergency help, call 911 immediately or 1-800-273-8255 if in the United States. If you are in another country, find a 24/7 hotline at www.iasp.info/resources/Crises_Centres. as we thought she was one of the happiest people on this earth. In this discussion paper, four individuals from surgery, nursing, medical training, and the clergy offer personal reflections on what led Kaitlyn, a young medical student, to take her own life in April 2013. Kaitlyn’s suicide letter and the effects on her family have been assembled by Dr. Pamela Wible in Physician Suicide Letters—Answered (2016) and is reprinted with permission. Excerpts of those letters appear throughout this paper. Every year an estimated 400 U.S. physicians take their lives (Andrew and Brenner, 2015). Numerous global studies involving every medical and surgical specialty indicate that approximately 1 in 3 physicians is experiencing burnout at any given time (Shanafelt et al, 2009). Medical students appear to be at an equal or higher risk of burnout, depression, substance abuse, and suicide. Because of the perceived and real risks associated with seeking help for such problems, many students, trainees, and doctors, and health care organizations fail to recognize, report, discuss, or pursue treatment for these conditions. The purpose of this paper is to shine a spotlight on this culture of silence, to understand the scope and complexity of the underlying issues, and to drive changes to deliver individual, organizational, and societal interventions that preserve and promote the physical and emotional health of care givers. In the following four vignettes, care providers write candidly about their own experiences in hopes that sharing their stories will help break down the Culture of Silence. did not let you in on my perpetual despair that I lived in. . . . Wide awake! What woke me so suddenly? The bedside clock reads 3:13 a.m. There are no noises, nothing unusual. Then I realize I am thinking of Kaitlyn’s heartfelt letter to her parents written before her suicide. I roll over—I need to sleep, I have a big day coming up. Relax, breathe, sleep. . . . It’s not working, I’m not sleeping. And it is now 3:31 a.m. Why can’t I get her story out of my head? I get up and go to my study, where I sit in the dark to think. My mind is wandering—not in a fluid, graceful way, but in a frenetic way, bouncing from one seemingly random thought to another. I realize these thoughts are not so random. My brain seems to be pulling up snippets of past experiences accumulated over a lifetime of becoming and then being a physician for more than four decades now. Short scenarios of long-forgotten (or perhaps suppressed?) events, good and bad decisions, and moments of personal triumph and absolute failure play out in my mind. One moment, I am reliving being told as a fourth-year medical student to “go stand in the corner [of the operating room] and keep your mouth shut” after pointing out that the faculty surgeon had inadvertently contaminated some tubing. The next moment, I am a chief resident in surgery standing in front of a room at the weekly morbidity and mortality conference being grilled and humiliated for making a serious error. The error had occurred when the faculty surgeon took the instrument from me because he had to “get moving.” He watched impassively as others rushed to “pile on” during the conference. I suddenly am recalling a time in February of my internship year when I was so tired, so down, and so discouraged that I thought I could not possibly go on. I thought I would have to give up on my dream to be a doctor. These and countless other personal recollections of the struggle to earn my stripes as a fallible human in a complex and imperfect medical system are interspersed with painful fragments of the letters from Kaitlyn, her mother, her aunt, and Dr. Wible and with snapshots of the absolutely wonderful, sustaining, and joyful moments that fill my life while caring for patients. I realize that the suicides of Kaitlyn and her mother are deeply disturbing to me because I have lived in denial of the dark side of the medical profession and its unwritten code—the code that says medical students should keep their mouths shut; that residents can be blamed since that is how they will learn; that repeatedly being pushed to the brink of exhaustion is a necessary part of being a caring physician; and that if a few drop out along the way, it is because they were weak and somehow deficient. Somehow I escaped, survived, and thrived, but it is not clear to me how that happened. Why was I not one of those statistics? I wonder about our physician daughter and her physician husband. Have I ever asked them in other than a superficial way how they are doing in dealing with the stress and strains of our profession and their busy lives? And I wonder about the department of surgery that I head. How many Kaitlyns are there among our trainees and our faculty? How can I sleep at night knowing that surveys of U.S. surgeons conducted with validated tools show a burnout rate of 40 percent, a clinical depression rate of 30 percent, and suicide ideation within the prior 12 months of 15 percent (Shanafelt et al., 2009). How can I not be concerned about suicide rates among physicians that are significantly higher than the general U.S. population (Council on Scientific Affairs, 1987)? Do we have the courage and will to break through the culture of silence, end institutional cover-up, and commit to finding effective ways for the healing profession to care for ourselves as well as for our patients? I am grateful every time my husband phones me after a challenging case, not because the case was challenging but because I can provide support, even if it is just listening. That phone call makes me smile, because despite his reticence, he reaches out to me in the time of need. As his wife, I worry about the days that I am “too busy” to take that call or missing the other subtle cues of stress and burnout in our “busy lives.” As I reflect on Kaitlyn’s letter and my own professional responsibility, I wonder about the physicians I work with and who they have to speak with after a challenging case, how they are working through the stressors of the health care culture and environment every day, and whether they bring their soul to work with them each day. I wonder where I can try to make a difference in caring for those who care and cure. This line in Kaitlyn’s suicide letter dated April 11, 2013, hit me hard . . . in the gut. It haunts me. The phrase “hiding from you” makes it all too clear that dear Kaitlyn felt boxed in by a pernicious Culture of Silence—a culture where she could not dare say what she really wanted to say, a culture where she was not able to feel vulnerable—to feel alive, to feel safe. I remember feeling the effects of the Culture of Silence throughout my training. In reading Katilyn’s story, one image came to mind. I was a medical intern. I stood on morning rounds with a full list of patients in the intensive care unit (ICU). The rotation was grueling, fast paced, and high pressure. You needed to move and move fast. There was no room for error. That October morning going in to my rotation, I knew I was going to be off. My aunt had just been admitted to the ICU in Hyderabad, India. Status asthmaticus. Intubated. A machine breathing for her. The rest of my family had taken an emergency trip and was now at her bedside. I got the report in the morning that she was now on two intravenous blood pressure medications, with her blood pressure just teetering above 60 millimeters mercury. I considered calling in sick, perhaps telling someone. But I thought no, I need to soldier on. Just keep focused. Eyes on the prize. What to do? I was trying my best, but now I was letting the team down—my patients down. And I was letting myself down. I felt weak, exposed for all to see, and vulnerable. The blue drapes, the endless beeps and chirps, the stares, the silence, the sterility of it all. The judgment. How could you open up with this culture? calm and free at the surface, but who is paddling furiously underneath. I concealed vulnerability with the fake cloak of strength. I pretended to be perfect and made it appear effortless—purchasing into the myth of effortless perfection. I held it all in. How wonderful would it be to just drop the tough guy act? How much energy and time would we save by just admitting this—our vulnerability—to our seniors, to our juniors—to ourselves? I remember thinking, now, in the ICU, it was now or never. Enough is enough. I asked my team to pause for a moment. I needed to break the silence—I could not pretend any longer. Time stopped for me. I knelt down a little so that my lanky frame was level with everyone else. And I shared. I opened up for the first time in my training. The duck’s paddling feet were exposed. I am sorry, I blurted. I told them about my aunt. I told them that I felt trapped in the ICU here caring for people I did not know when someone who helped raise me lay dying. I told them I felt weak. I told them that I was sad. I told them that I needed to lean on them. I took all of 2 minutes. I haven’t. And my team never will either. For what does my soul yearn? This is a question I have used in spiritual direction, helping one to look intently into the hollow of one’s soul to discover the truth of self. Typically, persons are looking for someone to know his or her soul, to peek into it on occasion, to not judge it, rather to seek to understand, to accept its existence, and dare to even love it. I write this reflection as a Roman Catholic priest of nearly 34 years. In my own experiences in another Culture of Silence (priesthood), I feel as though I know Kaitlyn’s soul as kindred in some ways. I live a profession that is respected (in most places), admired, placed on a pedestal, and revered by countless people. As a public figure, a priest most often dare not let himself get in the way of the image of priesthood. Often living in two separate worlds, the public image and one’s individual identity, the individual priest can and does experience feelings of painful aloneness. Just recently, corruption depleted the local archdiocese in which I serve in every way: moral, spiritual, and financial. Some of us local priests were targeted as those to throw under the bus ahead of the leadership. Although I survived the attempt, I did not survive the ability to continue to serve in the capacity I had for the past 34 years. When notifying friends and family of this horribly painful situation, the first question asked consistently was, “You’re still a priest, aren’t you?” Clearly, the image of priesthood that I portrayed was first in importance for them. Hurt even more deeply by such a question, I replied, “Yes, in excellent standing.” And then I wondered if who I am as a person (soul), my being, my identity, and who I am as God created me to be mattered. Was my identity even known any longer? When role identity replaces soul identity, an incredibly painful and hollow feeling becomes pervasive. I try not to dwell on that invasive, pervasive reality because it takes my mind to the question of purpose and reason for existence. For me, to seek to share my soul is now much too frightening. Acceptance of my soul might not match the image that one or more holds of priesthood. That results only in continual criticism of being. It is far easier to live with the aloneness and learning to dance with my own soul. For some, like Kaitlyn, the pervasive aloneness and sadness become much too much to endure, and, perhaps, one’s soul chooses to no longer remain in the pain. 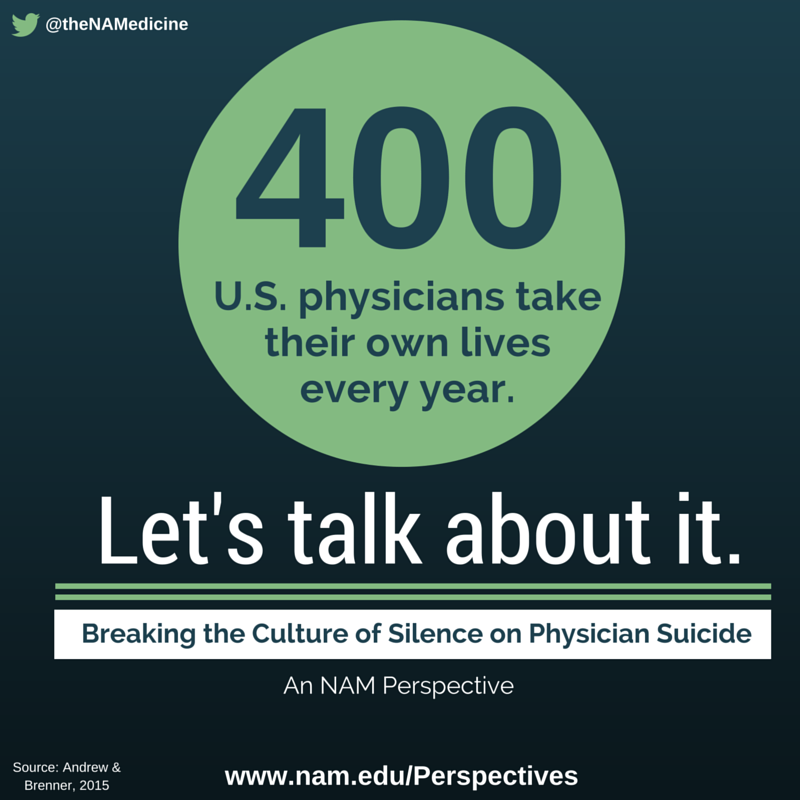 Together, our voices are meant to provide a spotlight on the growing problem of physician suicide. If you are similarly moved, please share your story and your reactions so others can learn from your experiences, just as you have learned from the reactions and reflections of Sandeep, Father Doug, Angela, and Dr. Rothenberger to the letters of Kaitlyn and her family. Anyone is free to send written thoughts, opinions, or personal accounts to sunny.kishore@gmail.com. These written comments will only be shared if the writer and those easily identified in the remarks provide explicit permission to do so. By working together and openly expressing our vulnerabilities as human beings, we can build awareness among friends, colleagues, and classmates that “you are not alone.” Seeking help indicates strength, not weakness. Through unified action, physicians, medical students, and those who care deeply about their well-being can work together to change individual views and influence system deficiencies that lead to and perpetuate the Culture of Silence. I am so dreadfully sorry for the unimaginable pain and hurt that I have caused you by taking my life. I am sorry for hiding from you that I was so deeply sad. I am sorry for not letting you know that I felt like I simply no longer wanted to live my life. I am sorry that I did not let you in on my perpetual despair that I lived in. Depression is nothing new to me. I can’t remember a time in my life in which I didn’t feel like I was barely treading water. I never told you how pervasive it was because I wanted to protect you from it, and I wanted to protect myself from it. But I have finally decided that I’d rather just not exist. I have found myself happy on occasion, and I have had many pleasurable things in my life, but mostly I feel overwhelmingly sad and exhausted from the weight of it. I would just rather not endure it any longer. I would have died years ago, but I couldn’t bring myself to cause you such sadness and heartache. I still can’t bear to think of the hurt this brings you, but I just can’t go on. You both are the most wonderful parents on the face of the earth. Please do not blame yourselves. Please don’t wonder what you could have done. The only thing wrong is me. I love you deeply. I respect you immensely. I wish I could have waited until you both had gone peacefully many years in the future, after you’ve fully lived your own beautiful lives, but forgive me that I couldn’t. This is the worst thing I will ever do to you. I am sorry I cannot ever make amends. I just want you to know that I love you so very much and that even though I don’t want to live, I still wish you all the happiness in the world, and I wish I could be able to have it with you. I know you may not understand why I didn’t seek help. I don’t know if I can really explain why. I just want you to know that I may be incomprehensible and you may be angry with me, but I am not angry, and while it eludes me why I was destined to live the way I’ve lived and to feel the way I’ve felt, this choice makes sense to me. I know I had such a seemingly bright future, and I know I would have been such a successful doctor and wife and mother. But all I have ever desperately wished for is to not feel like not existing would be preferable to being who I am and living the life I live. But that’s never been true. And that’s deeply sad and horrible and possibly terribly unfair. But that is how I feel and how I’ve felt for longer than I can remember. It may be inadequate and it may not justify my action, but it is the best explanation I have. I hope you will forgive me. I hope you can be happy again. I hope you can find the strength to endure this burden I’ve placed upon you. And I hope you will never doubt how much I love you. Please take care of [my cat] Gatito. If you can’t bear the thought of him living with you, please find him a good home. I know this will hurt him, but I want to limit that hurt as much as possible. Please make sure the people to whom I have left letters are notified and that they receive my letters. Their phone numbers are listed below their addresses. You do not have to call them, but please make sure someone does. On April 11, 2013, I lost my twenty-three-year-old, brilliant daughter, Kaitlyn Elkins, to suicide. She was just beginning her third year of medical school at Wake Forest School of Medicine in Winston-Salem, NC. Saying we were and still are devastated is a great understatement, but another thing was the absolute shock as we thought she was one of the happiest people on this earth. She was sweet, brilliant, gifted in all academics as well as an artist, poet and writer, and marathon runner. And she never, ever in her whole life showed her depression to us (her parents) or her friends, except she did tell her last boyfriend that she was depressed at times, but she told him we knew. We didn’t. I think she told him that so he would not tell us. She was highly functional until the last day of her life, going to great lengths to plan her suicide and did it like a well-planned school project. She was doing very well in med school. She left us a two-page suicide note, as well as one to four of her friends and one to her sister. In it she told us she had been depressed all her life but hid it from us to protect us from it and to protect herself from it. She said she could not explain why she never sought help. She said she was exhausted from the weight of her depression and this is what made sense to her. She always told us she loved medical school. I’m not sure, but since she said she had been depressed all her life, maybe medical school added so much stress that it made her depression worse. I think she never asked for help due to the stigma and she was a perfectionist and did not want to be seen as weak. She had to know, as well as I know, that depression is an illness, not a weakness and can be treated. But for whatever reason, she did not seek treatment. She was an introvert, but did have close friends, but I don’t think she had any in medical school. Whenever I asked if she had any friends in med school she said no, that mostly everyone went their own way. I did not worry about this, but in hindsight I think she felt lonely and isolated. I had no idea that depression and suicide rates were so high in med students as well as MDs until she died. I think as a child she must have suffered existential depression that so many gifted children suffer. Feeling alone because no one thinks as deeply as most people their age do, though I did not even know what existential depression was then, but only since her death I have researched this. Med schools and the medical profession need to put more emphasis on mental health of their students and colleagues. They need to make it so no one fears losing their license by admitting they need help and getting it. I just wanted to write to you because I am so glad you are bringing attention to this topic. I wish you continued success with this and maybe we won’t lose as many brilliant med students and physicians that could have lived on and made a wonderful impact in our world. Oh, I would really love to speak with you. Thank you so much for writing me. I knew about your daughter, but I had no idea how to contact you. Thank you for our talk last night. You are doing wonderful work and if I can help in any way, please let me know. My grief drove me to writing and researching because I could not understand how someone so accomplished, who seemed so happy right up until the end, could kill themselves. I’m a nurse and I know the signs of depression very well. She never showed one single sign. I began on Facebook, then I started a blog to write about my grief. Soon I had an outpouring from some of her classmates and other doctors and residents. They told me how isolating medical school is. I also learned Kaitlyn probably did not seek help for her depression due to the stigma and fear that if she admitted to it, that it would ruin her medical career. I found out that any student or physician must report mental illness of any kind. That is why so many medical students and physicians take their own lives. Kaitlyn was the brightest, most gifted person I have ever known and the joy of my life. Something must be done to end this stigma and to make it where doctors and students do not fear losing all they have worked so hard for. Thinking they will lose it all takes all their hope away, and what is life without hope? I wrote a book about my daughter this past year. Another therapeutic way for me to get my feelings out, but it is also very much a warning to parents, teachers, counselors, medical students, and faculty that the very intelligent can be prone to existential depression and can hide their depression very well, a fact that very few people know. I will ship you a copy next week. [Posted to her Facebook page] I spoke about Kaitlyn [at my medical school presentation]. I will post video soon. I spoke about you as well and read your writing. And held up Kaitlyn’s book. It was amazing. My first standing ovation! Nothing beats a room full of inspired medical students. When you didn’t “like” my Facebook post, your family knew something was wrong. You usually respond right away. I found out later that while I was inspiring medical students, you went missing. They found you the next morning. You died just like your daughter Kaitlyn, by suicide. I attended your funeral yesterday in Clarkton, North Carolina, where I met your kind family and dearest friends. I lost one of the sweetest people I never met. Rhonda, you touched me so deeply. Yet I could only touch your casket. Rest in peace, sweet, sweet soul. I’ll continue where you left off with more devotion than ever. I’m here if you need me. XOXO. Thank you so much for your tireless crusade to educate educators, mothers, fathers, brothers, sisters, and all [people] about physician suicide prevention. Rhonda Sellers Elkins was my beautiful sister, whom I miss very much. She just could not go on in life with the guilt of not being able to see the lifelong depression that her daughter, Kaitlyn, suffered. Unfortunately, with Kaitlyn’s depression, she chose the profession that was probably the worst she could have chosen. Everyone needs to know what goes on in med school and you, Dr. Wible, are truly making a difference. I say thank you. Download the graphic below and share it on social media! Andrew, L. B., and B. E. Brenner. 2015. Physician suicide. http://emedicine.medscape.com/article/806779 (accessed May 4, 2016). Council on Scientific Affairs. 1987. Results and implications of the AMA-APA physician mortality project: Stage ii. Journal of the American Medical Association 257(21):2949–2953. Shanafelt, T. D., C. M. Balch, G. J. Bechamps, T. Russell, L. Dyrbye, D. Satele, P. Collicott, P. J. Novotny, J. Sloan, and J. A. Freischlag. 2009. Burnout and career satisfaction among American surgeons. Annals of Surgery 250(3):463–471. Wible, P. 2016. Physician suicide letters—Answered. Eugene, OR: Pamela Wible, M.D., Publishing. Sandeep Kishore was a Fellow with Yale University, and is an incoming Assistant Professor at Icahn School of Medicine at Mount Sinai Health System and the president of the Young Professionals Chronic Disease Network. Reverend Douglas E. Dandurand is a Roman Catholic priest, a consultant and contract employee with the University of Minnesota, and a spiritual health facilitator at the Minnesota Personalized Medicine Clinic. Angela Mathew is director of clinical operations with the Department of Survey at University of Minnesota Health. David Rothenberger is the Jay Phillips Professor and chairman of the Department of Surgery at the University of Minnesota. The views expressed in this Perspective are those of the author(s) and not necessarily of the authors’ organizations or of the National Academy of Medicine (NAM). The Perspective is intended to help inform and stimulate discussion. It has not been subjected to the review procedures of, nor is it a report of, the NAM or the National Academies of Sciences, Engineering, and Medicine. Copyright by the National Academy of Sciences. All rights reserved.